As the opening in the North Carolina Governor’s Cup Saltwater Fishing Tournament series, the 25th Annual Hatteras Village Offshore Open is an exciting multi-day fishing tournament where anglers from all over North Carolina compete for cash prizes and championship bragging rights. Last year, over 20 teams participated with Sea Toy taking the first spot and receiving a $35,785.00 payout. Registration check-in occurs the day before the fishing starts and includes a captain’s meeting. Fishing takes place during the day with weigh-ins occurring in the afternoon at the end of each day of competition. On the final day of the tournament, a dinner and awards ceremony will take place in the evening. Although the official 2019 schedule is still to be determined, last year’s events included t-shirt sales, a 50/50 raffle, pig pickin’ and live music. Proceeds from the event support the Hatteras Village Civic Association. The North Carolina Governor’s Cup Billfishing Conservation Series celebrates sportfishing while promoting marine conservation and protection. Managed by the Division of Marine Fisheries, this 8-tournament series awards anglers in “private boat” and “charter boat” categories for number of billfish caught and released during the tournament that meet the state’s sizing regulations. The tournament opens with the Hatteras Village Offshore Open in Hatteras, NC in May and closes with the Pirates Cove Billfish Tournament in Manteo, NC in August. Hatteras Village is located on the southern tip of Hatteras Island, a 42-mile long island south of Oregon Inlet. Made up of the towns of Rodanthe, Waves, Salvo, Avon, Buxton, Frisco and Hatteras, there are plenty of great attractions to check out while you are in the area for the Hatteras Offshore Open. If you love fishing but aren’t a participant, try your luck at the Avon Fishing Pier or along the shores of one of the many beach access ramps. You can also visit the Chicamacomico Lifesaving Station in Rodanthe or climb the famous Cape Hatteras Lighthouse in Buxton. If you love history, stop by the Frisco Native American Museum & Natural History Center in Frisco or the Graveyard of the Atlantic Museum in Hatteras. 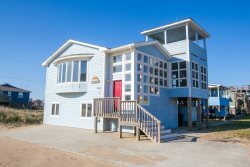 If you need a place to stay, check out Seaside Vacations’ Hatteras Island Vacation Rentals. Cost: Registration already closed but supporters welcome! For more information, visit https://www.hvoo.org/. Jessie has been coming to the Outer Banks since she was just 5 years old. She loved it here so much that she finally relocated in 2018. Now her mission is to show the world that the Outer Banks is an incredible place that everyone should experience. When she isn't working, you can find Jessie hanging out with her friends, chilling at home with her awesome cat, Yoji, or discovering a new Outer Banks adventure.